Karyn, what was your background and history before yoga? Well, I feel I had a pretty “normal” upbringing in suburban Melbourne. Our family would always go camping / bushwalking for holidays and my Dad would sometimes take his telescope to look at the stars. We were given an appreciation for nature and the need to protect it, as well as an understanding of the need to care for others, this most likely came from my parents participation in the local church. Both my sister and I have followed rather unconventional ways of living. Maybe this is a result of my Dad always telling us “not to be sheep” and to always think for ourselves. I never felt any pressure from my parents to follow a certain path of study or to aspire to any particular career. I am very thankful for this! I can remember it always came down to what made us feel happy. After my secondary schooling I studied Nursing and had a strong interest in community nursing. I had this plan (in my head) that I would get my nursing degree, then my midwifery qualification and then travel to Africa to do aid work or maybe just get a community nursing job here in Melbourne. I was very drawn to working with people and also to make some kind of positive change in the world. But, things never work out how you plan! I guess you can say that in my early twenties I got somewhat disillusioned with the system. I had my nursing degree and was working in one of Melbourne’s biggest hospitals, but life wasn’t what I thought it would be! I was stressed, overworked, anxious about going to work and didn't want to go back to study. I’d wake up every morning anxious about the day ahead. I would come home after late shifts and binge eat to try to relax. As a way of destressing I loved to go out dancing, particularly to bush dance parties that were starting to happen outside of Melbourne. We would be up all night dancing to a deafening techno beat surrounded by ancient gum trees. This is where I found some connection, it was other worldly, maybe this was partly due to the substances we also consumed. Although it was much fun, I felt toxic and so unhealthy. So I took myself to a naturopath and she recommended I take up yoga to help me to relax and deal with my anxiety. This is where I began. I looked up yoga classes in the local paper and found a Sivananda yoga class close by. I don’t remember much about this, except for doing shoulder stand in a dark room lit by candles. I also remember a strong sense of coming back into my body. That was still a couple of years away. I continued nursing and my once a week yoga class. I moved suburbs and found an Iyengar yoga school, which amazed me. Especially when I walked into my first class to find the fluorescent lights all turned on and everyone doing handstands against the wall! A bit different to my previous sivananda yoga experience. Anyway, I was coming up to my second year of nursing and I was still feeling under inspired, the thought of just continuing within the hospital environment was very unappealing as was the thought of further study. A couple of my best friends informed me they were heading over to Nepal/ India and then onto the Middle East for a twelve month trip and without knowing what I was getting myself in for, I said I wanted to come too! It was early 1996 when our plane touched down in Kathmandu and it was December 1996, after an amazing twelve months of backpacking and adventure, that I said good-bye to my friends in Cairo and headed onto London. I knew if I headed back home with my friends I would fall into the same patterns, travel had made me bolder and given me confidence but nothing really had changed. I knew there was more to discover and this was not necessarily going to come from just travelling around. So I arrived in London, got a job with a nursing agency, and contacted the Iyengar Institute to ask whether there was a teacher near where I was living. Luckily for me the teacher in my area was William Robertson, a New Zealander and a great teacher who introduced me to the concept of practising more than one day a week. Wow! He taught us individual sequences appropriate to each student. About March 1997 William announced he was returning to New Zealand for a few months. I was shocked, what about my yoga? I asked him what he'd recommend I do, and he pointed out a John Scott flyer on his noticeboard. My question to him was, "What is Ashtanga yoga?" I don't remember his answer, but the following week I was in John's led class. John came up to me before class and asked if I'd ever done Ashtanga yoga before. My response was, no, but how different could it be? Anyway, I was amazed. I felt like I'd come home. I think I only lasted as long as the standing postures, but I knew this was it. I'd never experienced such a powerful combination of breath and movement, it was magic and moved me in a way I'd never experienced before. That night I was on the phone to my fellow yoga friend telling her we HAD to do John's beginners weekend workshop starting that Friday night. 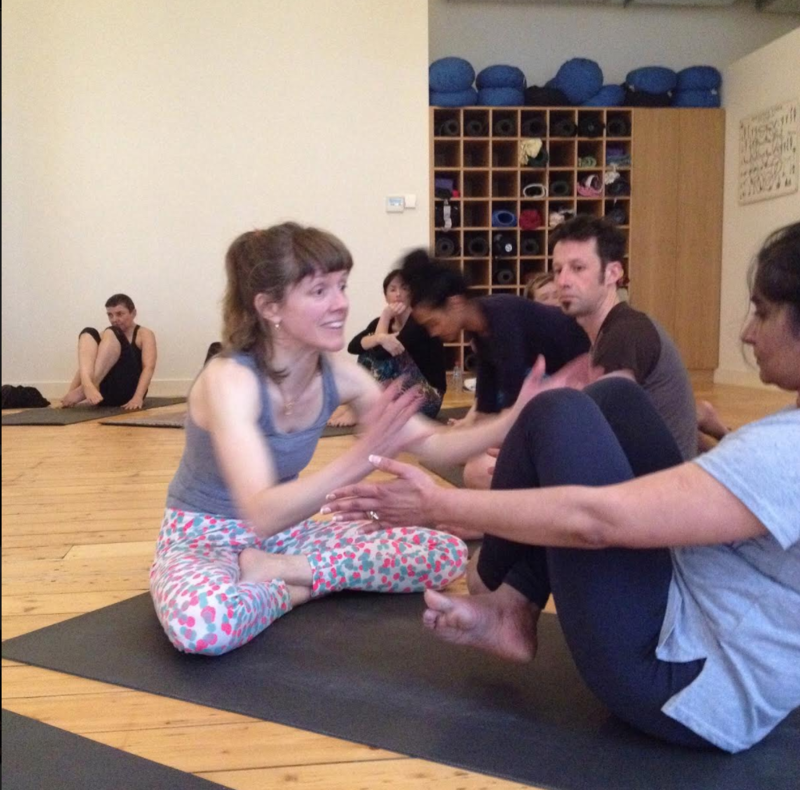 We did that workshop and the following Monday morning I signed up for five days a week Mysore - style practice. It felt like the natural thing to do. By the end of the year I was on the plane to Mysore. What exactly about the practice hooked you in? Well I think it was a few things. I can remember coming out of that first led class with John feeling completely alive, uplifted and challenged. I loved the beautiful fluidity of the vinyasa, the movement breathing system. It seemed to me that we were creating stillness within the movement, this was something no other yoga class had showed me. The internal focus, the sound of my breath, rather than being led by a teacher; the fact that the Ashtanga practitioner is responsible for their practice, you get out what you put in. It seemed very logical and accessible to me. I think something that hooked me in from the start was John’s very encouraging and positive approach. I felt like he was sharing something very special with me, something that I, even as a beginner, had the opportunity to experience. Right from the very first class he was talking about Mysore, Guruji and Sharath. It seemed to me inclusive and all encompassing. For me, at that time of my life, with no responsibilities (other than paying my rent), away from home with no family or friends requiring my time, I could completely commit myself to experiencing the practice. Also, previously I had never been a very physical being, other than breaking out on the dance floor now and then. I’d much prefer to be reading a book than pursuing a physical pursuit. The practice was so challenging for me because it brought me face to face with my physicality. Quite early on in the practice my body started to change in ways I never thought possible. I got strong! 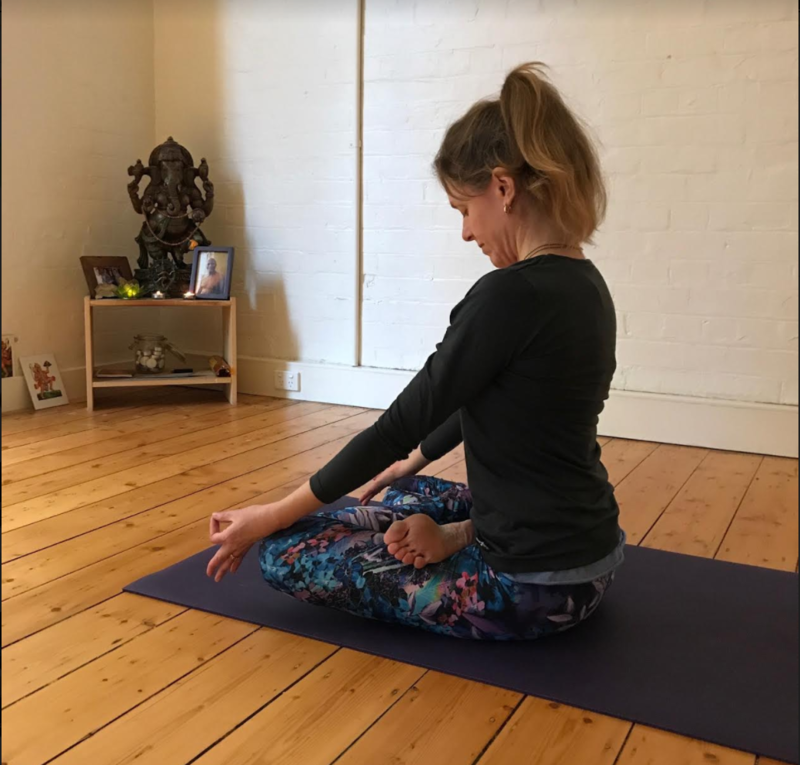 It was amazing to realise I had control of my body and that what I was doing on my mat was directly affecting my physical and emotional being. I guess I was experiencing a kind of homecoming, an appreciation of myself and a breaking through the layers of so much conditioning of my youth. It was a powerful “hook”. Why did Guruji and now Sharath, always emphasize the role of breath? The breath is the heart and soul of the Ashtanga practice. That is why Guruji and Sharath emphasise it so much. Where there is no breathing there is no yoga, there is no connection to the internal. It brings our practice from the physical to the subtle internal. This is what the breath does; it is the key to our inner being, to our inner most self. And it is only by working with the breath, in a slow consistent manner, do we as practitioners, have the chance to start working with and unraveling all the baggage and tensions we accumulate on a daily basis. I feel that when the breath is present in practice it also takes the strain out of the body, and allows the practice to be heart centred rather than muscle centered. It is also through “free breathing” and “breathing with sound” that we start to warm our blood and move energy around the body. It is through this movement of energy that health and vitality come. The sound of the breath also provides us with a focus point, it brings the mind in and anchors it in the present. I don’t know if you have experienced this, but if you have a stressful event the breath instantly shallows and as a result the body stiffens. This is a normal state for so many people. If we can just keep coming back to the breath, notice what is happening on a moment to moment basis and allow some ease to come back into the body we are on our way to healing. Guruji would say, “breath control coming, mind control possible”. This says it all; yoga is all about controlling the movements of the mind. For example, noticing when we feel stressed and instead of falling into habitual patterns of tension, be present and move the mind to a different focus. The breath is the key to experiencing yoga. This is how the Ashtanga practice works. And of course, everyone can breathe, so everyone can practise yoga. What was your experience meeting and practicing with Guruji and Sharath? I arrived in Mysore for the first time in January 1998. I felt overwhelmed and in awe of Guruji and Sharath. I can’t remember much about my first meeting with them, but I remember my first practice. Sitting on the stairs in the old shala listening to the breathing of those practicing before me and feeling the energy. There was an intensity there that I can’t explain. It was amazing to watch. I was the last one to finish practice that morning, Guruji was out in the front room having coffee, and came back in for my back bends. I was so nervous. As I came up out of my back bend Guruji gave me a big hug. My anxiety, tension and confusion all melted away. His compassion, dedication and devotion towards his students was 100%. What I found so refreshing and inspiring was Guruji’s and Sharath’s openness and acceptance to all who came to learn yoga from them. The fact that this man, who embodied so much of the tradition of yoga, was willing to share this practice with me blew my mind. By the time I reached Mysore in 1998 I had been away from Australia for over two years and I was intensely homesick. Coming to class every morning, receiving hugs from Guruji and support from Sharath was like a balm to my homesick soul. I’d lay in the finishing room upstairs listen to the ticking of the grandfather clock, smell the sambhar (it smelt like my Grandma’s pea and ham soup) cooking downstairs and let the tears flow. Whilst it was an intense time for me I felt nourished and so very fortunate to be there. I have been dedicated to the teachings of Guruji and Sharath since this first trip. Their steadiness and commitment to the practice and their students is something I often think about. I feel this first trip really cemented the process of the practice within me. Guruji and Sharath had given me something very special which I committed myself to continuing and now I have a commitment to sharing it with others. What is the essence of Guruji’s teaching to you? When doing back bending with Guruji and I happened to lose my breath, or my mind interrupted the process and I botched the whole thing up, maybe I fell, or wasn’t able to be in the moment, I’d come up and Guruji would be there asking; Why?” or, “Why fearing?” Yes, indeed, why? Why wasn’t I able to stay in the breath, focused, why did my mind interrupt, restrict my breathing and limit my acceptance of the moment. Practice, at its best, is about learning to stay, learning to breathe when you are in places you are not used to, and learning to let go of old patterns. I think this is the essence of Guruji’s teaching; giving us the tools to move beyond the chatter of the mind, beyond our anxieties, our stories and our expectations. He taught that through the use of Tristhana (3 places of attention, 1. Breathing system, 2. Drishti - looking place, 3. Asana - posture) during practice and always in conjunction with each other, we are able to work on our obstacles and understand ourselves more fully working towards a place of greater happiness and health. 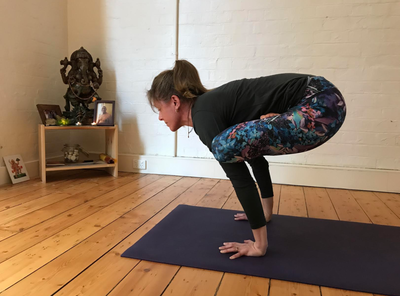 It is such a challenge to keep the mind focused on our drishti, whilst doing correct breathing and working on whichever asana, but this is the nature of the practice, to be challenged and to slowly, slowly experience the freedom of yoga from moment to moment. Only too quickly is the mind ready to jump in and distract us with thought. Everyday in his Mysore class, Guruji urged his students to go deeper, move beyond the limitations of their mind and its chatter wherever they may be in their practice; beginner or advanced. Through teaching students individually, in the Mysore class setting, he made yoga accessible to all. He insisted that yoga is for everybody. 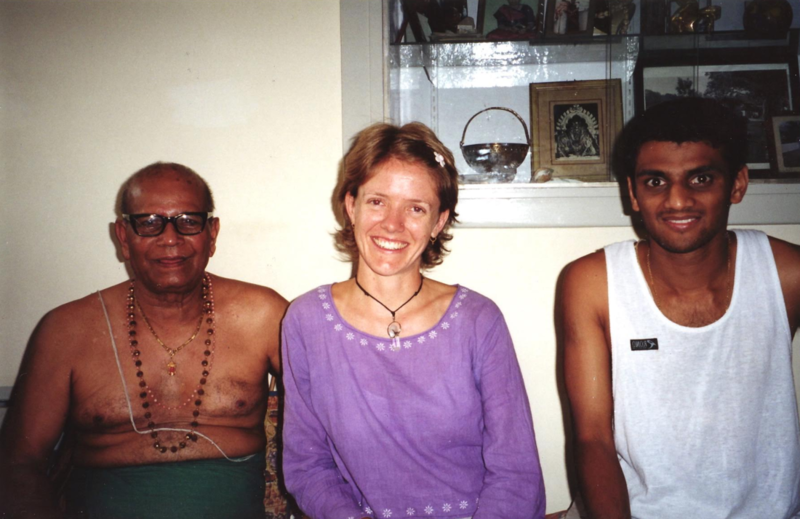 Occasionally I watched Guruji working with a beginner in Mysore, it was so inspiring! He’d sit down in front of their mat and take them through Suryanamaskara A, then sit them down and check their breathing. He emphasised correct breathing (holding the lower abdomen in whilst breathing with sound), correct drishti “look here!”, and how they were holding the posture (bandhas). Everybody can benefit from the mind made steady through yoga. By saying, “Take practice!” or “practice, practice, practice!” he was encouraging us not to sit on the sidelines, but to make the commitment, be dedicated, be disciplined and directly experience the benefits of yoga for ourselves. If we can experience this we may have the opportunity to understand what he meant when he said, “see god everywhere”. So difficult in our world, but if we can try to understand and practice this, our hearts will soften and I’m sure the world will be a better place. Guruji’s life also holds the essence of his teachings. His pure devotion to the study of yoga, his family and his students have shaped the practice of Ashtanga yoga in the world. When I first stepped onto the mat twenty years ago, there was a warmth and love coming through the practice that I had never experienced before, this was coming from Guruji, via his students to me. This has kept me practicing. What would you now tell the Karyn that first stepped on the mat years ago? To be happy and trust, as really, everything is actually ok wherever you are in the practice. What does a consistent practice over a decade reveal to you? Nothing ever stays the same both on the mat and in daily life, learning how to deal with these changes and be ok; centered and grounded with what is happening, is what the practice keeps on driving home for me. For the past twenty years my practice has been the constant in my life, but I’ve changed, my world around me has changed, the way I practice has changed, so much has changed and continues to change daily. Stepping onto my mat time after time, jumping back time after time, breathing, drawing my attention within, feeling what is happening in my body, with my breath, constantly brings me back to the truth that the only way to stay sane and happy in the midst of this constantly changing world is to find steadiness within. To tap into this steadiness and groundedness there needs to be consistent practice. The years of practice have taught me that consistency doesn’t mean a predetermined length of practice or particular series. You just have to be honest with yourself; do what you can, when you can, get on your mat and breathe, follow that breath and be ok with where you are at today. For example; I often practice when my three year old is sleeping in the afternoon, sometimes I only have half an hour, sometimes an hour. In whatever time I have, I practice. 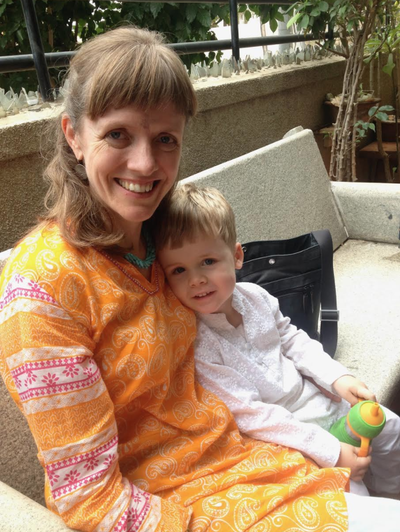 I try to be consistent, but aware of my other responsibilities as a mother, partner, yoga teacher etc. I have often fallen into the trap of wanting to “get” somewhere with my practice, eg. the next posture, catch my ankles (! ), perfect tic tacs etc., but I’ve learnt time and time again that this just doesn’t get me anywhere, or improve my relationships or deepen my understanding of yoga. What nurtures me and makes me more present for those around me is practicing consistently with the intention just to be where I am, no where else. This is what gives steadiness, strength and also longevity in practice. Standing before my Mysore class this morning at 6 AM, about to chant the opening prayer, there was focus; a presence of the lineage of teachers who have gone before us. I love this moment in class where we stand together, give thanks and humble ourselves before our teacher’s teacher, asking for guidance to see things more clearly. It is wonderful to think of all the practitioners around the world, also standing in samasthith, chanting the same ancient sanskrit words, expressing gratitude and setting their intention to finding more peace on all levels through practice. This is powerful. Practicing yoga is so worthwhile, keep going.